Real estate in Texas has been on the rise in 2015. Although not hit as hard as many other areas in the nation during the recession, the state has seen an impressive amount of investment and development this year. This developmental growth alters the landscape and vitalizes an area. The last thing a real estate professional wants to do is talk about change while referencing an outdated map or digital image. The Texas markets were screaming for mapping updates, and Landiscor listened. In 2015 Landiscor released new Aerial Wall Map Murals for the 4 major Texas markets and Houston was at the top of the list. With the previous update coming in 2012, real estate firms, utilities and government agencies in the Houston were in desperate need of new maps. Recognizing this need, Landiscor went to work on our Houston Aerial Map Mural. After locating an imagery source and investing many hours of research to updating the data displayed across the aerial wall map, a new version was released. To make things even better, we added Hospitals & Medical Centers to the already impressive 10-Layer GIS Market Data Model that was instituted by Landiscor over 25 years ago. Now users of the map can refer to it with confidence and excitement knowing it will help verify the story they are telling. In addition to the Aerial Wall Map Mural, Landiscor has made available the digital imagery used as the base layer for the map. This is a perfect addition to any mapping application a client may be using to incorporate into their project. Besides, what is a map with no picture, right? This imagery is 2ft resolution and terrific for a quick snapshot of an area to be used in a marketing presentation for a particular property. It covers 25 counties and over 21,000 square miles of land. Need more information? 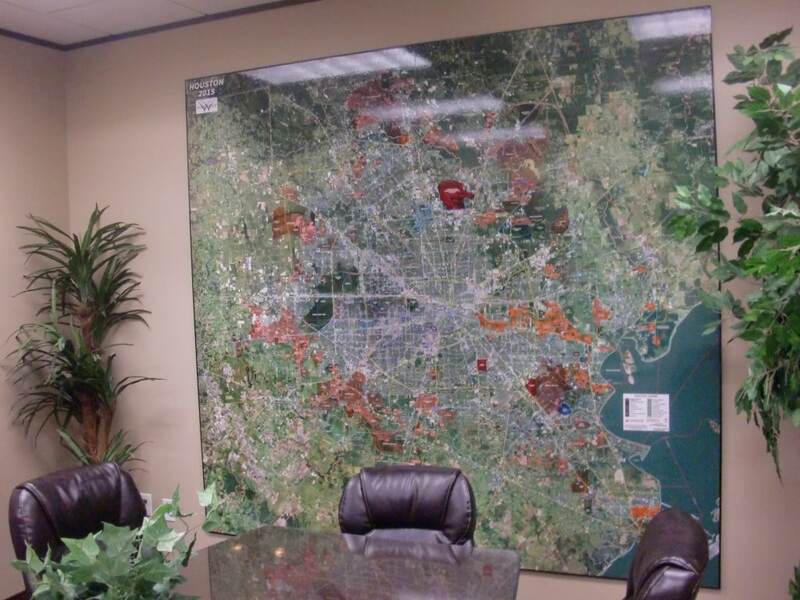 Contact us today at 866.221.8578 or check out the Houston Aerial Wall Map Mural or view more samples of the 2ft resolution digital imagery now. View our new post on Slideshare detailing the process of how we create the Aerial Wall Mural product. As a collective society we love a transformative story. Whether it is a character in our favorite movie or the narrative of an entrepreneur on a show like Shark Tank, we cannot get enough. Simply put – something that inspires us. We love taking something and ultimately making it better. Companies all over the world have championed this philosophy since the dawn of industrialized thinking. How do we take what we have here and convert it to [fill in the blank] to serve a greater need? Businesses like Apple, Ferrari and Boeing are constantly testing how they can improve their product or process to remain on the cutting edge of innovation. Where am I going with this? Well I am certainly not intending to compare Landiscor to the likes of Fortune 500 companies; however, I am assimilating the shared philosophy of improved design. To do this I had to start at the beginning. When I sat back and really thought about it, what Landiscor has believed in from its very inception is the power of information – more specifically the information surrounding the change, development and growth of some of our nation’s largest metropolitan areas. Change is necessary to reflect time, behaviors, patterns, choices… and the list goes on. Real estate is no exception to that fact. As we as people change so do our cities, towns and neighborhoods. Change is sometimes met with growth. Growth gives birth to expansion. Here is an all too familiar example. Jobs are introduced into an area. New infrastructure is added to help support the local community. New residences are developed. 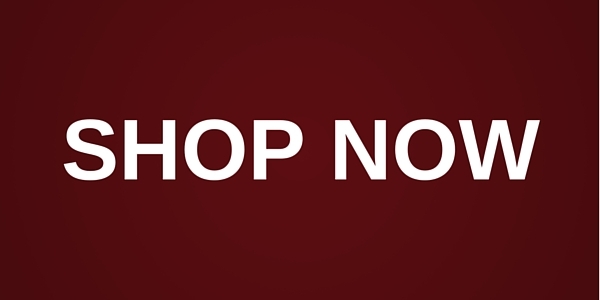 Retail and shopping centers are constructed to service those new residents. Schools, parks, amenities, etc. This consolidated information creates an environment for faster and better decision-making while providing instant market credibility to real estate commercial brokers, land developers, builders, utilities and governments. So, how do we keep up? This is where Landiscor comes in. We map the new and reoccurring development throughout a pre-defined market area. With access to current imagery we are provided with a fresh perspective of the growth areas and change happening on the ground. We take this raw image and combine it with information that is most vital for our customers to see and understand which we gather through a refined, in-depth research process. 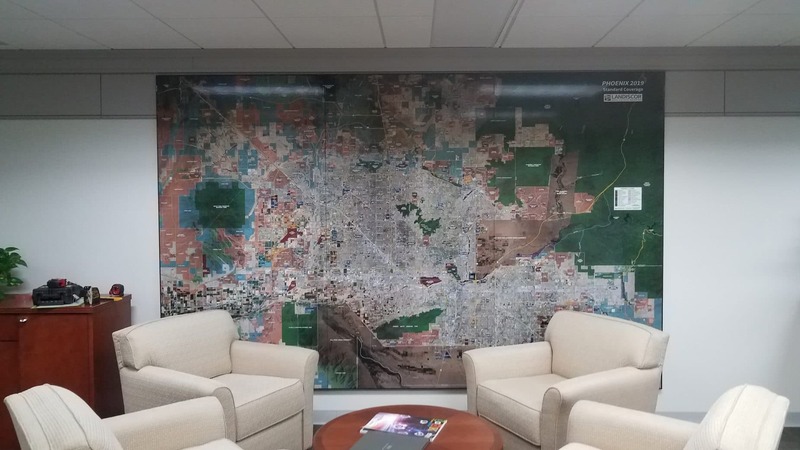 The result of this is the highly unique and valued “10 Layer GIS Model” that we include on every Aerial Wall Map Mural Landiscor creates. The goal is to provide insight to our customers about their local environment so in turn they can accurately communicate the message to their clients. With a presence in over 25 markets, this equates to thousands of pieces of relevant information that visually shares a compelling story of change in a given area. We recognize that in some cases it doesn’t end there and the client has a personal narrative to share. Introducing the “11th Layer”. The 11th layer consists of specific client data they wish to be digitized to the aerial map, along with our data, in order to communicate their individual footprint within the total market design. Using the top mapping and graphic software, our production team is able to incorporate this custom data onto the map and allow the client to be part of the collective story. Please visit our Market Data Model page to learn more.